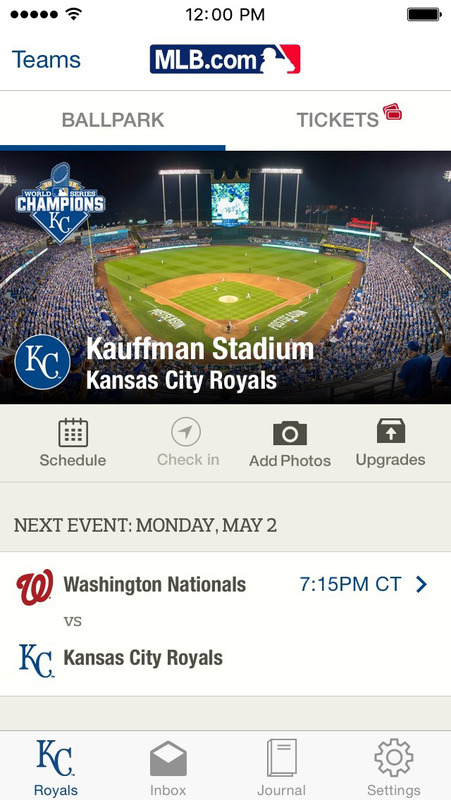 The MLB.com Ballpark app is your favorite mobile companion when visiting any Major League Baseball ballpark. This official MLB application perfectly complements and personalizes your trip with My Journal, tickets, social media, offers, rewards and exclusive content. Additional features available at select MLB ballparks include automated check-in and offers and points-of-interest with iBeacon technology as well as mobile food ordering and seat and experience upgrades. Angel Stadium (Anaheim), Chase Field (Arizona), Turner Field (Atlanta), Oriole Park @ Camden Yards (Baltimore), Fenway Park (Boston), U.S. Cellular Field (Chicago), Great American Ball Park (Cincinnati), Minute Maid Park (Houston). Kauffman Stadium (Kansas City), Marlins Park (Miami), Miller Park (Milwaukee), Target Field (Minneapolis), Citi Field (New York), O.co Coliseum (Oakland), Citizens Bank Park (Philadelphia), Petco Park (San Diego), AT&T Park (San Francisco), Safeco Field (Seattle), Tropicana Field (Tampa Bay) and Globe Life Park (Texas). Additional ballparks will be added as they become available. Citizens Bank Park (Philadelphia), Chase Field (Phoenix), Marlins Park (Miami). Turner Field (Atlanta), AT&T Park (San Francisco), Dodgers Stadium (Los Angeles), Great American Ballpark (Cincinnati). Additional ballparks will be added as they become available. © 2016 MLB Advanced Media, L.P. All Major League Baseball trademarks and copyrights used herein are the property of the applicable MLB entity. All rights reserved.